We provide our clients quality range of Supreme Roofing System. These are procured from our reliable vendors and are highly durable. These are available at market leading prices. - Sealing of gaps at overlap i.e side lap and end lap. Metal roofing has emerged as one of the large scale building material substitutes for asbestos cement sheets or any other roofing products. 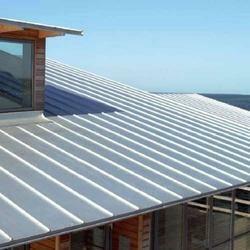 Metal roofing allows elegance and flexibility in the design for the outer shell of the industries or warehouses. Cintro is a roof system that is extremely suitable for arched spans, for instance to cover walkways, carports or even extensions to your house. The system has been especially developed as an architectural solution for bended or arched roofs. 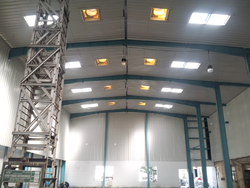 The possibilities for application are numerous and may even include light roofs. Experiment with different looks for your home to find the one you love. Modern Roofing Product are established in response to growing interest in Giant Structures, Modern life style, Best Outlook of Premises, With better quality Durability and Capability Of Roofing, METFORM ROOFING is Committed to fulfill Structural requirement & complete satisfaction.